In December 2018, Deep B.V. performed a breakwater inspection survey for CDR International B.V. to obtain data for assessment of the current status of the two port of Quetzal breakwaters in Guatemala. Puerto Quetzal is Guatemala’s largest Pacific Ocean port. The survey was conducted in collaboration with Skeye to obtain two datasets to achieve a complete overview of the condition of the breakwaters and surrounding seabed. 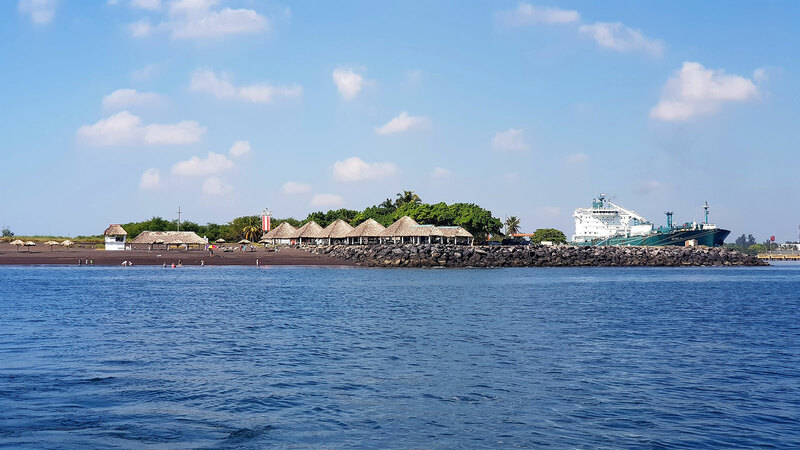 Survey of breakwaters: A continuous survey of the seaward and landward slopes of the Puerto Quetzal breakwaters was required to provide the necessary information. The underwater survey (wet) was conducted using a dual-head multi beam echo sounder. The port of Quetzal has a tidal range of approximately 2.0m at spring tide. The multi beam survey was executed with dual tilted transducers to measure as close to the waterline as possible. The topographic survey (dry) above water was carried out with a drone using aerial photography obtained by a geometrically calibrated camera. 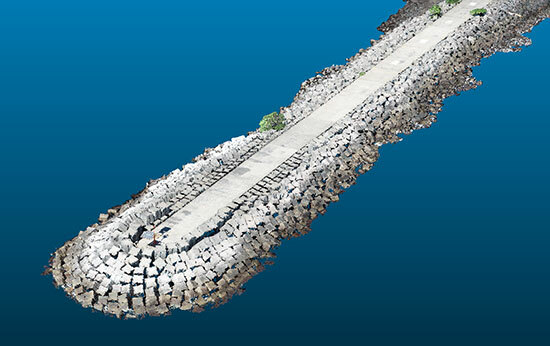 By performing the ‘wet survey’ with high water spring tide and the ‘dry survey’ with low water spring tide, the expected overlap between the two datasets was sufficiently achieved, resulting in a combined dataset that was well-suited for extensive analysis of the structural integrity of both breakwaters (by CDR). Survey of seabed: A bathymetric survey of the seabed around the breakwater was required to provide information on possible locations of moved armor material and to obtain the current bathymetry inside and outside the port for further studies. The survey was conducted with a line spacing that ensured 100% coverage in a 0.05m grid of the breakwater. 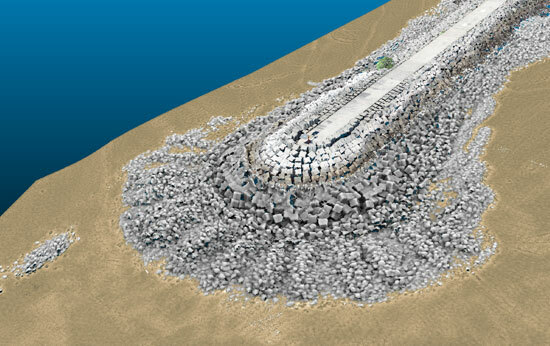 The seabed surrounding the breakwaters was covered by a 0.10m grid. Conclusions: The datasets gathered were of high quality: the underwater part of the breakwater can be clearly visualized and the combined dataset can be compared with the original design with high accuracy. 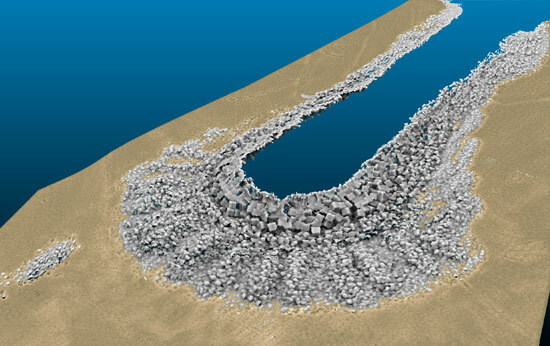 Due to operational limitations of the underwater part in shallow areas due to local sedimentation, not all nooks and crannies could be fully covered. From a hydrographical point of view, both breakwaters seem to be in pretty good condition.